Darrell Roberts, Executive Director, Helmets to Hardhats ("H2H"); Arielle Dailey, a former U.S. Army medic who found her apprenticeship with Sheet Metal Workers Local Union 66 through Helmets to Hardhats; Mike Stotz, President, ITC. 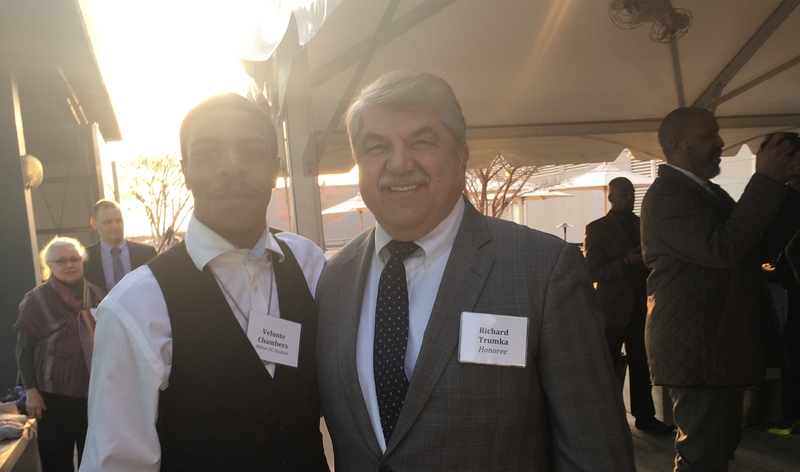 Washington, D.C. (April 15, 2018) -- The AFL-CIO Investment Trust Corporation ("ITC") joined North America's Building Trades Unions ("NABTU") for its fourth annual reception in support of Helmets to Hardhats. The event was able to grow to a level not seen in years prior thanks to the addition of co-host United HealthCare ("UHC"). International Brotherhood of Electrical Workers' ("IBEW") annual Construction & Maintenance Conference and NABTU's 2018 Legislative Conference. The event was attended by union delegates, veterans advocates, and government officials, as well as those in the business community. introduced the first speaker of the evening, Secretary of Labor, Alex Acosta. (L to R)Brent Booker, Secretary-Treasurer, NABTU; Secretary Alex Acosta, U.S. Department of Labor; Darrell Roberts, Executive Director, H2H; at the ITC's 4th Annual Benefit for Helmets to Hardhats. 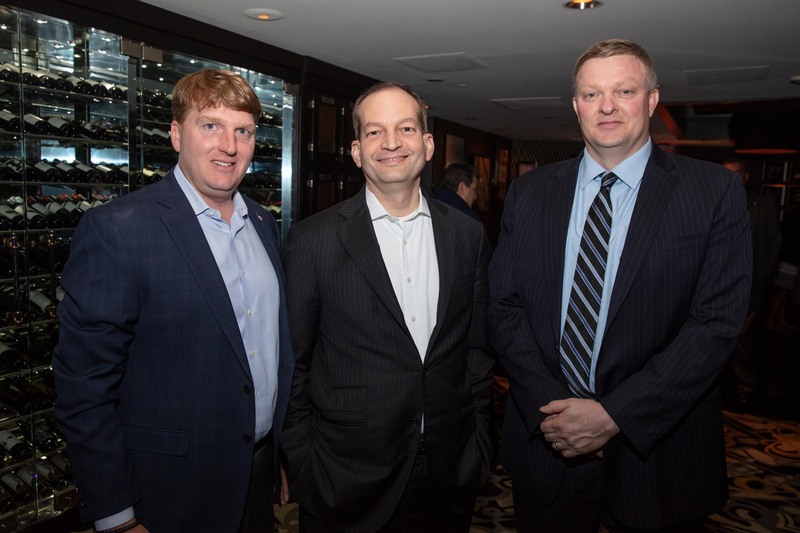 "The men and women in the military serve us by putting their lives on the line, and it's great when they're transitioned back to civilian life by someone who cares," Secretary Acosta said at the event. The Secretary added, "Whether it's for veterans, those struggling with addiction, or those who have faced challenges re-entering society after incarceration, the Building Trades really focuses into putting people into good, family-sustaining jobs." Attention was then turned to Col. Sam Whitehurst of the U.S. Army's Soldier for Life ("SFL") program. A 28-year veteran infantry officer, Col. Whitehurst has had deployments to Bosnia-Herzegovina and multiple tours in Iraq and Afghanistan, and now is in charge of the program that develops a network of resources to support every soldier, veteran, and their families through all phases of their service. Col. Whitehurst spoke about how he appreciated that Helmets to Hardhats does more than helping to put over 27,000 service members in apprenticeship programs since 2003. 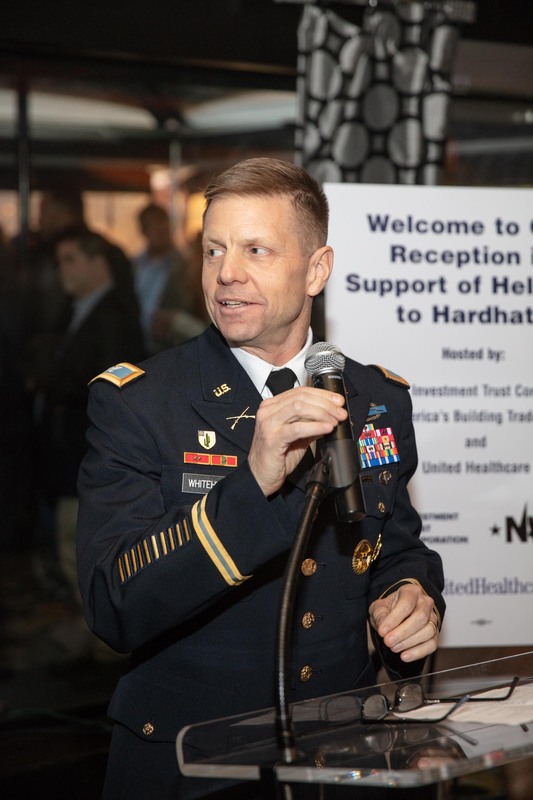 Col. Sam Whitehurst, Director of the U.S. Army's Soldier for Life Program, at the ITC's 4th Annual Benefit for Helmets to Hardhats. "What I find really impactful is the focus that Helmets to Hardhats places on retention," Col. Whitehurst said at the event. He added, "At Soldier for Life, we want to make sure that you find the spot where you can be a real member of your community, and Helmets to Hardhats helps do that by making sure our vets get more than a job, they get a second career." After Col. Whitehurst, Phil Barbaro, who serves as Senior Vice President of UHC's Public Sector Division, thanked Helmets to Hardhats for all that they do. 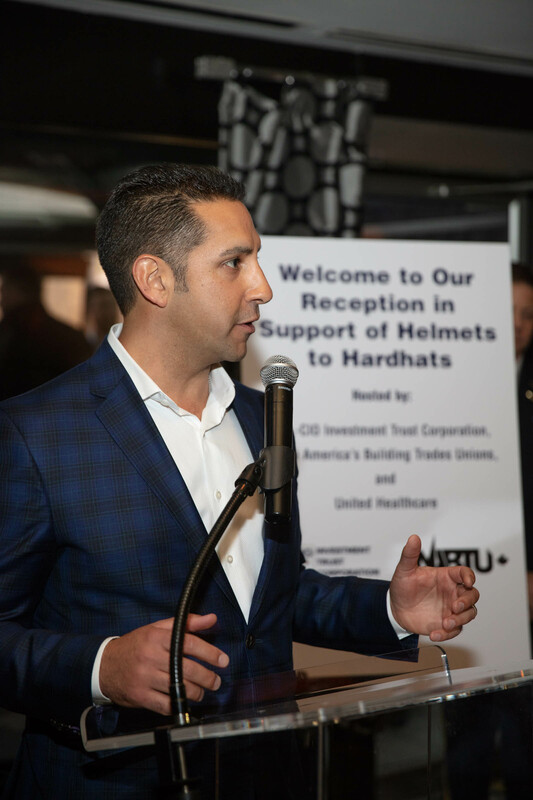 Phil Barbaro, Senior VP/Chief Growth Officer, UHC Public Sector/Labor & Trust, at the ITC's 4th Annual Benefit for Helmets to Hardhats. "Re-integrating our veterans into the workforce not only creates a better environment for them, it helps to create healthier communities for everyone around them," Barbaro said. Barbaro, who is also Chief Growth Officer for UHC's Labor & Trust Division added, "At United HealthCare, our goal and mission is to create healthy environments for those that we serve. So I would like to thank Helmets to Hardhats for helping to give us that opportunity." Darrell Roberts, introduced Arielle Dailey, an apprentice of the program, to the crowd. A native of Seattle and former U.S. Army medic, Dailey spoke about her unique journey from being a woman in the military to being a mom in the Trades. Dailey recounted her frustration of trying to navigate into the medical field post-service, during which her Marine-turned-Sheet Metal Worker brother suggested the path that worked for him, Helmets to Hardhats. Arielle admitted that she halfheartedly followed his suggestion, but thought it would lead to more frustration, as her family was in the process of growing. That fear would later turn into motivation when she realized that her local, Sheet Metal Worker's Local Union 66 ("LU66"), had two other women in their apprenticeship program who were also expecting. 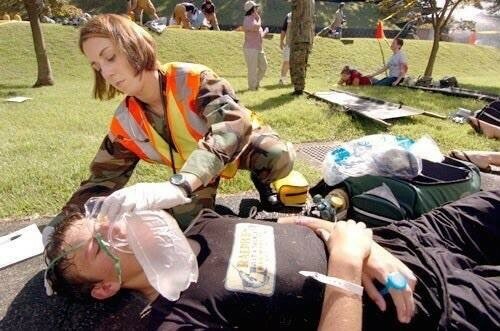 Older photo of Arielle Dailey while training to be a medic in the U.S. Army, Fort Sam Houston, TX. "I hid it until it was noticeable. Then I spent so much time researching what I could say to fight for my cause and what it meant for the women in the union," Dailey recounts about a time early during her pregancy in the apprenticeship program. She then pointed out Sam Hem, a LU66 Business Agent who was at the benefit, and added "when I approached him he said 'You're right. We're going to work on that' but I didn't really believe him at the time." For being a person who earlier in the evening had claimed to never be quiet, Dailey took a long pause. Then she spoke about how she was surprised some time later during a regular Monday apprenticeship class when a form was handed out regarding LU66's new family leave policy. 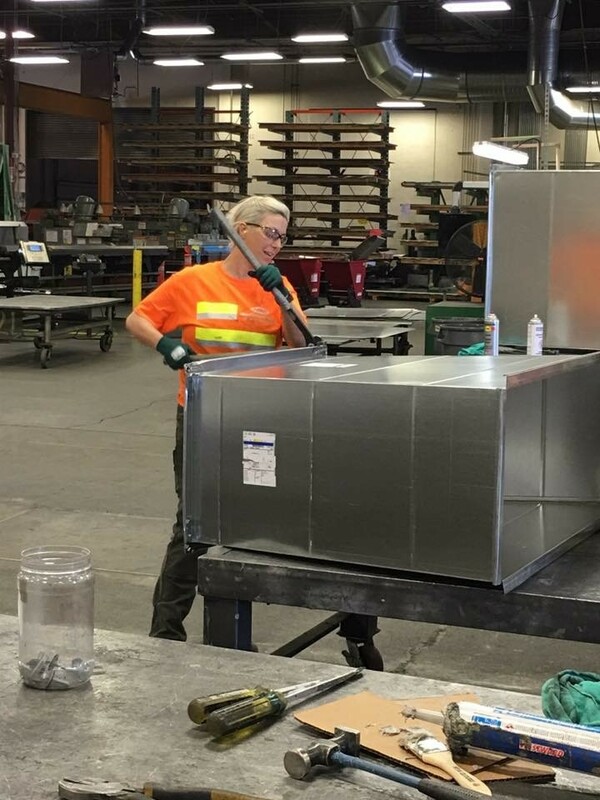 Recent photo of Arielle Dailey while training to be a union sheet metal worker at a facility of the Western Washington Sheet Metal Joint Apprenticeship Training Committee. "Before that moment, I liked my job, but after that, I felt like these guys had my back 100% of the way, and that my problems were their problems," the H2H apprentice said. She closed the night by saying, "I hadn't felt that way since I got out of the military, so at that point I felt like 'this is my family now,' not only could I count on them for whatever I need, but it occurred to me that this was the only job I've had since the Army where I knew that I could also get equal pay for equal work." In addition to UHC, the ITC would like to acknowledge and thank all of the organizations and individuals who made a contribution to H2H at the event. If you would like to donate to benefit Helmets to Hardhats, contributions are tax deductible as provided by law. Helmets to Hardhats is administered by the Center for Military Recruitment, Assessment and Veterans Employment ("CMRAVE"), is a 501(c)(3) non-profit organization, tax exempt number 43-1972568. Checks should be made payable to CMRAVE. For more information about H2H, please click HERE. 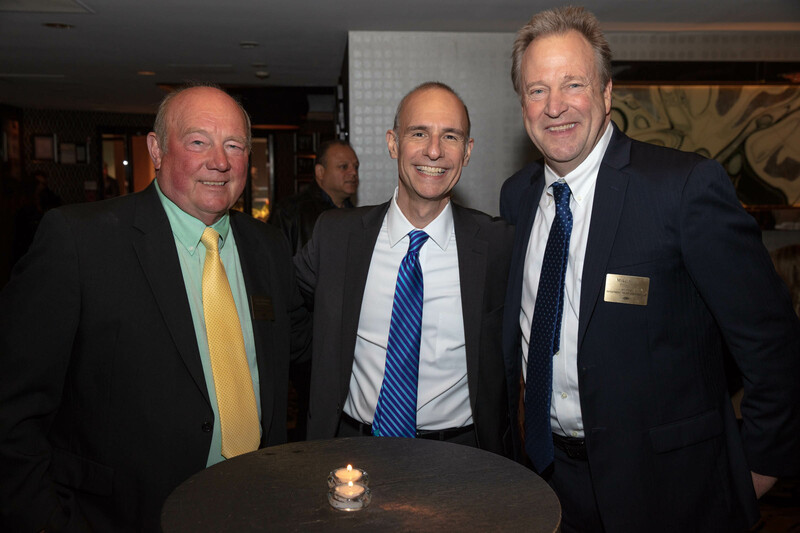 (L to R)Lynn Fieldman, VP of Construction/Labor Relations, ITC; David Blumenstein, President and CEO, the Segal Group; Mike Stotz, President, ITC; at the ITC's 4th Annual Benefit for Helmets to Hardhats.